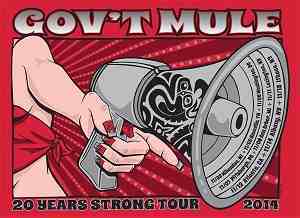 Official concert tour poster for the 2014 Gov't Mule fall tour. It's printed with metallic silver ink on red french paper. This is an artist print, that measures 22" x 16" and is hand signed by the artist, Jeff Troldahl. Our posters are carefully wrapped in kraft paper and then put in a strong round mailing tube, that goes into a triangle tube and all taped up. We double tube our collectible posters when shipping.